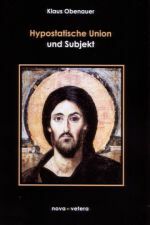 On July 27th, 2011 we published a notification on a new critical edition of Aquinas’ De unione verbi incarnati, edited with substantial commentary (500+ pages) by Dr. Klaus Obenauer. Dr. Obenauer has just released a new study on the theology of the hypostatic union, Hypostatische Union und Subjekt (Bonn: Nova et Vetera, 2012). This is a focused work (109 pages) engaging what the Germans call “Konstitutionschristologie.” Enjoy! Aquinas’s De unione verbi incarnati: An Interview with Klaus Obenauer, part 2. On Wednesday, July 27th we posted an announcement about a new volume on Aquinas’ disputed question, De unione verbi incarnati. Below is the second installment of an interview with the author, translator, and editor of the volume, German scholar Prof. Dr. Klaus Obenauer. Click here to read the first installment. Thomistica.net: Your commentary on the text is nearly 500 pages. How long did the translation and commentary take you to complete? Dr. Obenauer: It´s difficult to say, because of the interruptions and overlaps with other activities, such as teaching etc. All in all, I’d say about three years altogether. Thomistica.net: Which aspect of the commentary was most enjoyable for you to work on? And, which aspect do you think makes the biggest contribution to scholarship in relation to the De unione and Aquinas’ Christology? Dr. Obenauer: I’ll limit my comments to articles 3–5. - And insofar I succeeded (as I hope) in offering innovative contributions and insights the whole commentary on these articles is, I think, relevant. With regard to the text of De unione itself the famous article 4 (on Christ’s esse) is, without question, of the highest interest to most. But I hope to have shown that the specific content and development of articles 3 (on Christ’s Unity) and 5 (Christ’s operations) are also of primary interest. These articles (3 and 5) have been, up to now, not sufficiently appreciated (pace Patfoort). Concerning my personal preferences, I´d say, that in some way, I enjoyed commenting on article 3 the most. It has its own speculative profundity. Even though it bridges with article 4, article 3 is fascinating because of its symmetry (“simpliciter unum propter unum suppositum, secundum quid duo propter duas naturas”). This degree of symmetry is lacking, at least in terms of resplendence, in article 4. Thomistica.net: Some commentators on Aquinas, because of the uniqueness of certain aspects of the De Unione, such as article 4, have either dismissed the work as spurious or relegated it to Aquinas’ early period. You, however, argue that the De unione is both a mature articulation and a work that should be dated rather late in Aquinas’ career. What are your reasons for these positions? Dr. Obenauer: The days of assigning the De unione to Aquinas’ “early period” or viewing the text as “spurious” are past. The very opposite judgment is held to be the “common sense” position nowadays. But whereas classical historians, such as Pelster, Synave and Torrell, have assigned the De unione to the end of the second Parisian period, there are good reasons to think of ca. 1270 as the year of writing. This suggestion is made formally by Concetta Luna (in the context of her edition of the ‘lectura sententiarum’ of Aegidus of Rome [cf. my historical comment on the first article]); I have tried to demonstrate that this is a veritable scenario. But I do not see it as more than that! There are a number of reasons to read De unione 3 and 5 as improvements over the parallel passages in the tertia pars. And, as already shown by Pelster and Synave and illustrated in my own synopsis, the striking parallels from De unione 1 to STh III, 2, 1 and 2 do not allow the redaction of De unione to be too far removed (in time) from that of the tertia pars. Thomistica.net: Prior to the publication of your volume, the French translation and commentary by Marie-Hélène Deloffre, “Question dispute L’union du verbe incarné” (Vrin: 2000) was, perhaps, the most sustained treatment of the De Unione in print. What are some of the points of agreement and divergence between your reading of the De Unione and that of Sr. Deloffre’s? Dr. Obenauer: I admire the contribution of Sr. Deloffre as a very valuable repertorium in matters of St. Thomas´ “Opera Omnia” and the historical background of the De unione. With respect to her options as a historical and systematical theologian, Sr. Deloffre is very indebted to the classical “theory of integration” developed by Hermann Diepen and his followers. Accordingly she interprets the saltem prima facie divergences in the texts with hermeneutics of harmonizing. From the point of view of a historian I am not in agreement with this reading. In my view, De unione 4 is a deviation! In STh III, 17, 2, for example, there is no mention of or place for a “hidden second substantial or non-accidental esse.” The framework of the distinctions leaves no room for the assertions of De unione 4—even if it is not completely impossible to identify some ambiguities in III, 17, 2 too. On this point, in particular, I am in agreement with the analysis of A. Patfoort. Even more: I think that Bernhard of Auvergne, Capreolus and Billot have been the legitimate interpretive heirs to STh III, 17, 2 (and the parallel passages). As a systematic theologian I have put myself forward as being in favor of a synthetic conception. I articulate my own interpretive option this way: The conception of the ‘unio secundum subsistentiam’ has to fix, principally, our understanding of how to apply the so called ‘esse personale Verbi’ (as the subsistence or personality of the hypostasis of the divine Son) to the human nature. This is a crucial point: the application of the divine esse to Christ’s human nature has to be made without making a (even if only conceptual) distinction between the subsistence and the act of substantial existence. In addition to this it may be asked, if there is room for a (‘etiam ratione actus’) second substantial esse as a (as I call it) “formal secum-ferential” of the “esse personale” in my interpretation? In order to safeguard the appropriateness of the “formal efficiency” of the divine esse in favor of the-Son-as-being-man, a second esse that performs only this function does agree with my postion, as long as it does not differ (numerically) from divine esse (‘in nova habitudine’) as ‘esse-simpliciter’ and ‘esse-hominem’. This way, and only this way, there is a kind of convergence between myself and the “integrationists,” but perhaps more so a trace of Louis Billot and Maurice De la Taille. Thomistica.net: Finally, tell us a little bit about how the book has been received? Dr. Obenauer: The reception of my book is in the very beginning stages, and in Germany there are only a few scholars interested and able to give such quick feedback. All that I have heard up to now is positive. Aquinas’ "De unione verbi incarnati": An Interview with Dr. Klaus Obenauer, part 1. On Wednesday, July 27th we posted an announcement about a new volume on Aquinas’ disputed question, De unione verbi incarnati. Below is the first installment of an interview with the author, translator, and editor of the volume, German scholar Prof. Dr. Klaus Obenauer. Thomistica.net: tell us a little bit about yourself, your education, research interests, and your teaching. Dr. Obenauer: I am a so called Research Assistant at the Faculty for Catholic Theology of the University of Bonn. This position is sustained by the “German Research Society” (Deutsche Forschungsgemeinschaft [DFG]). I teach Dogmatic Theology in Bonn and (temporarily) in Cologne. My primary field of research is what we call the “Constitutional-Christology” of St. Thomas and his School. My specific projects in this area include: St. Thomas’ De unione (now completed and published in the volume that we discuss below). Currently I am researching the contributions of a few select great Thomists: Bernhard of Auvergne, Capreolus, Cajetan, Bánez, and The Salmanticenses. Thomistica.net: How did you become interested in the De unione project? Dr. Obenauer: Potius casu et fortuna. - And: After having worked on Aquinas’ metaphysics in my habilitation thesis, my interests became focused on the crucial problems of Constitutional Christology. Thomistica.net: Tell us a little bit about the preparation of the critical edition of the Latin text. Dr. Obenauer: Apart from the concrete (and final) redaction which always entails that difficult judgments be made, the preparation of the Latin text was in no way based solely on my merits. I am in deep gratitude to Fr. Adriano Oliva, Ph.D., who is currently head of the Leonine Commission. Fr. Oliva gave me access to copies of the manuscripts that the members and cooperators of the Commission deemed most important. The critical Latin text included in my volume on the De unione is the result of a process of collaboration, in which Fr. Walter Senner, Ph.D., who teaches at the Angelicum in Rome and who is a former member of Leonine Commission, along with his assistant, had the principal role in evaluating the manuscripts. We met for a series of sessions in which the manuscripts were collated for critical evaluation. Thomistica.net: Do you know anything about the current status of the Leonine Commission’s work on the De Unione? And, will there be any relationship between your text and the work of the Commission on the De Unione? Dr. Obenauer: As I noted in the previous question, Frs. Oliva and Senner were extremely helpful in my work on the De unione, but there is no formal relationship between my text and the Commission. Furthermore, as you probably understand, it would be indiscreet for me to say more than that I am aware of existing preparatory works on the text by the Commission. And, I think that a Leonine Edition of De unione is not to be expected, at least in the next several years. Thomistica.net: Can you mention one or two aspects of the Latin text in your volume that you think scholars and students of Aquinas will find particularly interesting? Dr. Obenauer: Apart from the supplementary passages in DU 1 ad15 - presented already by Deloffre in her volume on the De unione (Paris: Vrin, 2000), which I discuss more in part 2, - the most surprising fact is that the 13th and 14th-century manuscripts, which we consulted, with respect to article 4 use “sustentificare” instead of “substantificare.” This is a significant change, say, from the common text published in the Marietti edition. It appears three times in the third paragraph of the body of article 4. In this group of manuscripts there is but one exception to this usage. The only parallel, known up to now with regard to the critical editions, is the Qu. quodl. 3,2,2(/4) arg/ad1 (also christological context!). In addition: It´s also not completely impossible that the respective preliminary passage in the corpus of article 3 has to be improved in favour of “vel secundum formam accidentalem vel secundum substantiam,” instead of “substantia-lem”. The second part of this interview is forthcoming.